1. Persia: Place and Idea. 3. Alexander (330?323 BC), the Selucids (312?129 BC), and the Parthians (247 BC?AD 224). 5. ?Non-Iran? 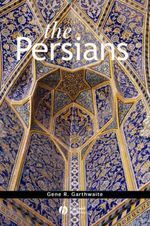 : Arabs, Turks, and Mongols in Iran. 8. Iran: 1921?2003: Pahlavi and Islamic Republican Iran.